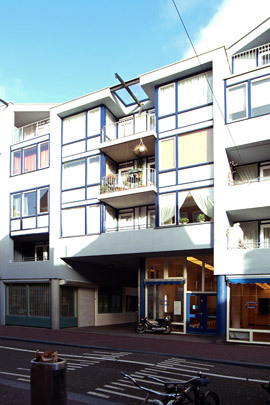 This consists of a seven metre wide pedestrian street with housing by Hertzberger sporting a unique variant on the porch access on the north side and two blocks of 30 units and two gateway buildings of 15 units by Van Herk and Nagelkerke on the south side. These blocks have a stepped structure to accommodate the narrowness of the street. Concrete-framed with an infill of sand-lime bricks, they boast a stuccoed exterior insulation finish, the first social housing in the Netherlands to do so. The white blocks fit well into their surroundings, yet inject a contemporary element rich in contrasts.